Check out my new mug! Less than a month after my favorite coffee mug was transformed by the force of gravity and a little black cat, reader and potter, Pat, sent me a new one! Thanks, Pat! 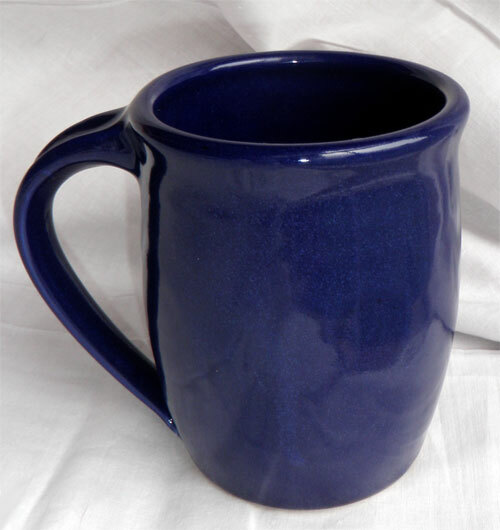 The new mug is the exact same blue/purple as the old one, which I find to be amazing. It’s also dishwasher and microwave safe, though I’ll assume it is not safe from gravity and cats, so I’ll be careful where I put it. Gorgeous mug! Now you just need a decoy mug for the cat to knock over so this one stays safe. My fave find after googling ‘leaf mug’ lol. That’s awesome, it really does look quite a bit like the old one! Long live the cup! I like the new mug. Maybe you should tell kitties to get their own darn mug and keep their paws off yours. Everything tastes better in a lovely mug or served on a pretty plate. Picking out what I am going to serve my breakfast on is as important to me as what I am serving. Even my peanutbutter knife matters… Enjoy your flashy new mug!